Following this information will be the title of your essay. For this example, we’ve chosen to research the relationship between President Trump and his former Chief Advisor (now head of Breitbart News) Steve Bannon. In your MLA-formatted research paper, the essay will come directly after the info provided in the upper left hand corner. Maintain the double-spacing but add no further spaces. Simply place the title in the center of the paper. For another example of how this should look, check out Purdue OWL. You can also find an example of how a research paper should be formatted in APA. What was Bannon’s Role in the Trump Administration? Why Did Bannon Resign as Trump’s Chief Advisor? View this article for a list of other research paper topics. Check out this article if you need assistance with completing a research paper outline. The unlikely path of Donald Trump to the White House in the 2016 U.S. election will be remembered for years to come. Few pundits predicted it and even fewer polls projected it. However, with the help of one strategist—Steve Bannon—Trump was able to overcome numerous obstacles and win the Presidency. Bannon’s reward? He was named White House Chief Advisor. To the public, Bannon promised sweeping changes in Washington and e helped write Trump’s inaugural speech, in which a practical revolution was forecasted. However, by August of 2017, Bannon was out and the Trump Administration had done little to differentiate itself from the two Administrations that had preceded it. This research paper will examine the nature of the relationship between Steven Bannon, the man who helped Trump win the White House, and Donald Trump, the man who let Bannon go after six short months of service in the Oval Office. It is based primarily on information obtained from Joshua Green’s Devil’s Bargain and other journalists such as Pepe Escobar, independent journalist and roving correspondent for Sputnik News and Asia Times. Notice how the introductory paragraph begins. It uses an interesting fact to catch the reader’s attention. Since this research paper is about the Bannon-Trump relationship, the opening sentence of the introduction focuses on the “unlikely path of Donald Trump to the White House,” intimating that it is an event worth understanding. This is “the hook”—the line that draws the reader into the paper. It leads right into the subject of the paper—because it prompts the reader to wonder how Trump managed to do this? Why, with the help of Steve Bannon of course, is the answer. The intro goes on to explain that not all is rosy in D.C., however—and that is what takes us into the body of the paper. Bannon rose from an unlikely background to be Trump’s top advisor throughout the second-half of his campaign in 2016. Bannon’s background was diverse: he had spent time in the military, as an employee of Goldman Sachs, as a Hollywood producer, a filmmaker, a speaker, an advocate of economic nationalism, and a news executive. It was through this latter role that he came into contact with Donald Trump (Green, 2017). Following a number of interviews in which the two seemed to see eye-to-eye, the pair decided to throw in together and push for the White House. Bannon saw in Trump “the perfect vehicle” for getting a policy of economic nationalism into the federal government. Trump saw in Bannon a firebrand workhorse with vision and the ability to plot a clear path to the White House by focusing on a group of voters feeling marginalized and ignored by the two biggest political parties in recent years—blue collar voters and rural Americans in Michigan, Pennsylvania and Ohio. These swing states became the key to Trump’s success in the election and it was Bannon who helped guide Trump’s message so that it resonated with this voting base. Bannon’s support of writers who were engaged in the fight against Trump’s opponent Hillary Clinton were also highly useful. The book Clinton Cash helped divert negative attention away from Trump towards Hillary in what would climax with a FBI investigation virtually right on the eve of Election Day (Green, 2017). By identifying the path to victory and helping others to throw shade at his opponent, Bannon enabled Trump to achieve the unthinkable. What was so unthinkable about a Trump presidency was the fact that Trump’s own background was completely foreign to politics. He was an outsider. He was crass and unapologetic. The mainstream media loathed him. Yet he was a nimble user of social media and had millions of followers tuned in to his every tweet. Trump had been a hit on TV with The Apprentice. He knew that his brash, assertive, humorous but matter-of-fact business-like manner resonated with certain viewers. The problem was—how could he make it resonate with more? The answer was Steve Bannon. Bannon had attempted to use Palin prior to throwing in with Trump (Green, 2017). Palin had been a media darling too—but she lacked a particular oomph or essence that more Americans wanted to see. Trump had that oomph in spades. He paraded it around with a bravado that made his opponents wilt. Bannon recognized it and Trump recognized what Bannon could do: marshal the waiting powers of the alternative media to push back against the Establishment and make room for the outsider candidate. And that is how they forged a friendship to the White House. With Bannon directing the way forward and honing Trump’s message, everything impossible suddenly became possible. The new Trump-Bannon team produced a script that resonated with those who despised the Establishment and wanted a strong leader to come and shake things up. Bannon helped shape Trump so that his political incorrectness was viewed as a boon rather than as a handicap. He supplied the political platform that Trump himself saw as the best pillars to stand on. But everything changed once election night was over and the reality of shaping an Administration came into place. The Establishment was not going to go quietly—and suddenly all those who had publicly opposed Trump were now sweating to be included in his Administration. Even Mitt Romney who had been among the most vocal critics of Trump during the campaign was now dining with the President-Elect and back-peddling on all his criticisms (Anderson, 2016). Under pressure from the Establishment to work with career politicians, generals, and lobbyists, Trump began to move more towards the center, away from his base, removing those who had been most loyal to him throughout the difficult times. As the months rolled on, and Congress made it apparent that it would not work with Trump on any of his platform issues—from immigration to the Border Wall to healthcare reform to taxes—Trump’s popularity declined. He brought in his daughter Ivanka and son-in-law Jared for advice. He turned to Goldman Sachs for assistance—gave a key position to Gary Cohn (even though Trump had railed against Goldman during the campaign to rousing applause from his admirers). He even backtracked on his promise to pursue legal action against Hillary. The fight that he had demonstrated during the campaign seemed to fizzle out now that he was in the Oval Office. Bannon was pushed aside as a flood of newcomers came to the stage, jostling for the President’s ear. Bannon’s influence quickly waned and he and Trump now seemed to be going in two different directions. Trump’s generals wanted to ramp up the war in Afghanistan; Bannon wanted out. Trump wanted to confront North Korea over its missile program; Bannon saw no sense to such conflict. Trump wanted Cohn on board; Bannon saw Cohn as one of the biggest threats to his policy of economic nationalism. Trump and Bannon had gotten along so well on the campaign trail—but now they were going in two different directions. The writing was soon on the wall. The question of whether Bannon was in or out would be answered by August, 2017. The man who helped get Trump elected would be ushered out and returned to his seat as head of Breitbart News, vowing to fight against those who opposed Trump’s policies (Escobar, 2017). The only problem was that Trump’s policies seemed to be up in the air, in flux, amenable, and unfixed. In truth, Bannon had been the policy man—Trump was just the vehicle. Now the vehicle was crammed full of new policy men, neoconservatives and neoliberals, and a new agenda was in the making. Congress would not work with the president on bringing those outsider politics to fruition. And so it is now: Bannon is on the outside once more—after a brief stint on the inside, where he once aimed to help Trump “drain the swamp” of Washington corruption. Instead, after half a year of being blocked at every turn by the well-Established and well-entrenched swamp creatures working in D.C., Bannon got the hint: he was not welcome there; he would not be able to change it from the inside; Trump was theirs—not his; and so Bannon was sent home to do what he did best, start a war of words and threaten to pull down the pillars of the Establishment from the outside (Escobar, 2017). Still, all was not lost. Bannon believed that the real Donald Trump was one who believed as his base believed. There were glimmers of this sentiment. Trump wanted to renegotiate NAFTA, put an end to offshoring, promote a Made in America policy, and get tough on illegal immigration. It was just a matter of finding enough people on the inside to support this agenda and weeding out those who opposed it. Bannon’s new plan, being back at Breitbart, was to help make it apparent to Trump just who his real friends were and who and how his enemies were hampering his agenda and disappointing his base of supporters. Bannon and Trump came together like lightning to split the Establishment into fragments. Yet, like a futuristic robot, those fragments came back together in the days, weeks and months following Trump’s win and subsequent inauguration. They posed a formidable threat to the promises that Trump had made with the help of Bannon, who crafted the message and the way forward—a way that many voters in the swing states wanted to see executed in the coming four years. But he Establishment rushed the new President and within months, he had fumbled the ball. One by one, those who had been near him throughout the campaign were removed, causing further weakness within the camp of outsiders. Finally the Establishment set its sights on Bannon and quickly made him out to be more of a distraction than a help for Trump—and so the two agreed to part ways, Trump working with a new team of advisors within the Oval Office; Bannon attempting to rouse Trump’s core of supporters and marshal the strength that had gotten Trump elected in the first place for a new fight against those who opposed the message they had embraced just a half year earlier. Time would tell who would win this next stage of the fight. Green, J. (2017). Devil’s bargain: Steve Bannon, Donald Trump, and the storming of the presidency. NY: Penguin Press. 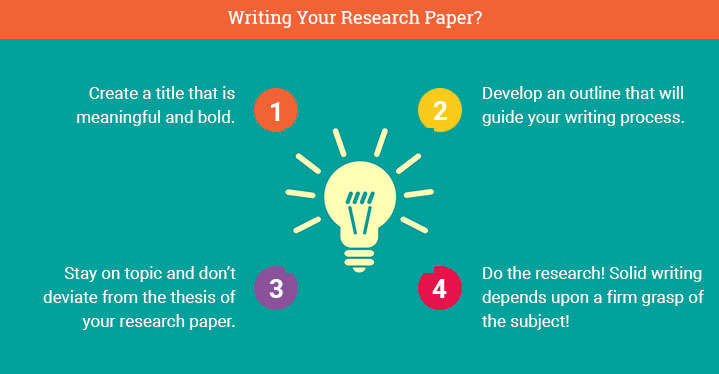 In this article, you learned a number of important points about how to write a research paper. The research paper example provided above hits all the main key elements, so let’s go through them one by one. First: Pick a good, strong title. This will be your anchor—the theme to which your entire paper should be oriented. Second: Always start off with an outline. The outline above helped keep the essay on track. It was a simple outline with an introduction, body and conclusion. It did not require a lot of details but it did make use of critical points in the development of the relationship between Bannon and Trump. With the help of the pre-determined title, the essay’s path was clear and the outline identified each of the key topics that the paper should address within the body paragraphs. Notice: each topic received its own paragraph to help tell the story of the Bannon-Trump alliance. Third: Use your introduction to capture the attention of the reader. The title acts as the morsel—the little nugget that catches the reader’s eye. The “hook” which leads off the introductory paragraph acts as the snare that forces the reader to stick with the paper. The hook works by giving the reader some point or fact or critical question to consider. The rest of the paper is seen as the answer or follow-up to this hook—and that’s why the reader stays with it. Fourth: Be sure to close out your introduction with a thesis statement. Tell the reader exactly what your paper will show and how it will do it. The essay example above noted where the key information came from and how it would be used to explain the Bannon-Trump relationship. Fifth: Make sure the body of your paper follows the outline. Remember: you made that outline for a reason—so use it! Sixth: Adhere to the standards and formatting guidelines of whatever writing style you are using—whether it is MLA, APA, Chicago or other. Seven: Conclude your research paper by going over the main points of the essay and summarizing the findings. Don’t introduce any new information into the conclusion. Simply re-state the main ideas that your study found and try to give it a final sense of meaning: what do all the findings indicate? What does it all mean? If there is room for future research, explain the direction in which it should go. Eight: Include a reference page that shows all your sources. If you can follow these steps, you’ll have no problem crafting a great research paper on your own. As always, writing a research paper depends primarily on having done the research. So it is imperative that you actually read up on your topic. Make sure you understand, at least in broad or general terms, what it is you’ll be writing before you get started. You don’t have to finish all your research before you begin writing the paper. Indeed, sometimes as you write, you realize that you need more info on a particular idea. For this reason, writing and research should go together: don’t compartmentalize the two! 1. Create a title that is meaningful and bold. 2. Develop an outline that will guide your writing process. 3. Stay on topic and don’t deviate from the thesis of your research paper. 4. Do the research! Solid writing depends upon a firm grasp of the subject! "Research Paper Example." Aceyourpaper.com. Student Network Resources Inc, 23 August. 2017. Web. 18 April 2019. Student Network Resources Inc. "Research Paper Example." Aceyourpaper.com. https://www.aceyourpaper.com/essay-writing/research-paper-example/ (accessed April 18, 2019).